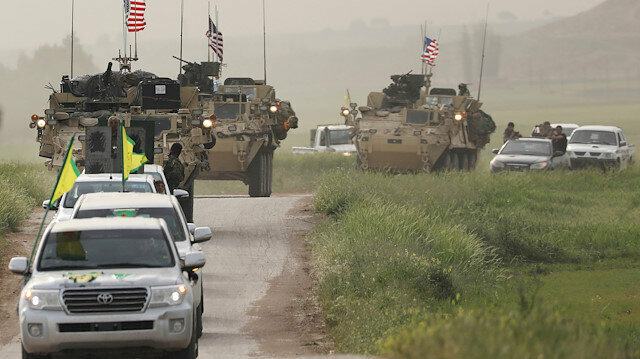 The YPG headd a convoy of U.S military vehicles in the town of Darbasiya next to the Turkish border, Syria April 28, 2017. Calling the terrorist PYD a legitimate group is "hypocrisy," said the acting chair of Turkey’s ruling party on Thursday. "It is not understandable for the U.S. to recognize the PYD -- the PKK’s Syrian branch -- as a legitimate organization while the PKK is listed as a terrorist organization by the U.S.,” Numan Kurtulmuş of the ruling Justice and Development (AK) Party told a group of publishers meeting in the capital Ankara. After entering the Saudi Consulate in Istanbul on Oct. 2, Khashoggi, a Saudi national and columnist for The Washington Post, was strangled and then dismembered, according to the Istanbul Prosecutor’s office. Even almost 40 days since the killing, pressure on the Saudi government must continue to find out what happened to journalist Jamal Khashoggi, according to an Egyptian journalist and human rights activist.“Actually after more than 40 days it looks like that the international community has forgotten about Jamal Khashoggi’s murder,” Osama Gaweesh told Anadolu Agency on Thursday.Turkey finds traces of acid, chemicals at Saudi consul's residence'Stronger opinion' on Khashoggi case next week: Trump“As we can see, the Jamal news moved from breaking news to daily routine news, and that’s exactly what the Saudis want -- they need time, and this is their bad bet,” he argued.He, added, though, that he believes “we will never ever give up and we have to keep putting pressure on Saudis via media, demonstrations, and demanding answers to three questions:“Where is the body?“Who gave the orders?“Who holds the accountability for this murder?”Khashoggi, a Saudi national and columnist for The Washington Post, disappeared on Oct. 2 after entering the Saudi Consulate in Istanbul to receive paperwork he needed to get married.Once inside, he was immediately strangled and then dismembered, according to the Istanbul Prosecutor’s office.- Khashoggi not forgottenWhile also pressing for answers, Katrin Pribyl, a German journalist, argued to the contrary that “the killing hasn’t been forgotten at all.”Also speaking to Anadolu Agency, Pribyl said: “The world is, rightly so, still shocked by the reported brutality and also the lack of information provided by Saudi Arabia.”“So it’s important and good that there was a review session at the UN this week,” she said.“The questions shouldn’t stop till everyone gets their answers. It seems like Saudi Arabia completely underestimated the worldwide outrage, which the killing of Khashoggi triggered,” she added.Pribyl said the journalistic community had a “very strong reaction to this shocking murder.”Turning to the war in Yemen, just south of Saudi Arabia, Pribyl said the war did not get enough attention before the Khashoggi killing.“It’s good that Saudi Arabia’s role in Yemen came under renewed scrutiny after the Khashoggi murder, as well as any sales links of some Western countries with Saudi Arabia,” she said. "Unfortunately many people aren’t aware of the fact that there are lots of investigative or critical journalists all over the world who are persecuted, imprisoned, or killed for doing their job, and their work is systematically hindered," she added.- Journalists' union: 'No impunity'A major journalists’ union in the U.K. earlier this week said governments across the world have a well-stocked toolbox to bring the killers of Khashoggi and the people who ordered it to justice.A National Union of Journalists (NUJ) spokesperson told Anadolu Agency that the union supports the International Federation of Journalists’ call for governments to end their cooperation with the Saudi government until it "tells the truth and arrests the perpetrators. "The group reiterated its call on the British government "to ensure there is a full and independent inquiry into the killing" of journalist Khashoggi, the spokesperson said, adding “there must be no impunity.”“All governments can act -- they have economic levers, diplomatic tools, diplomatic tools, and international instruments to seek to bring the killers and those who ordered it to justice,” said an NUJ statement.